I knew that anger is often linked to fear, but didn’t intuitively link it to grief. Most of us know that anger is a stage of grieving before you reach acceptance, but what if you or a friend or family member simply gets stuck there. Is there an appropriate time limit to mourning? 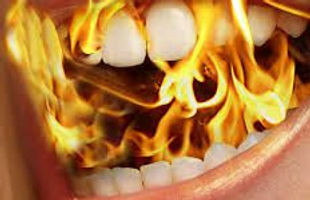 Those of us who deal with the chronic pain of Burning Mouth Syndrome may go through successive cycles of grief. We grieve that we hurt and don’t know why. Then we grieve the myriad ways our lives have been changed or our activities hampered by pain. Then we grieve that we cannot talk about our pain because it has gone on so long that we feel we are burdening others when we speak of it. That’s a lot of grief, my friends, and I know you have experienced many different and sometimes difficult reactions from your family and friends over the years. I recently saw a lovely video about helping your grieving loved ones and knew I had to share it with you. Check it out at Refuge in Grief’s video: How to Help a Grieving Friend. There are Spanish and English subtitles you can choose if you need them, and it was a brief and coherent way to convey some very important information. If I were grieving, I would hope that the person trying to comfort me had seen this video, and if I was comforting someone, I would be glad I had seen it. Take a moment and check out the awesome power of acknowledgment. It will feel awkward at first; I won’t kid you about that, but it really does help that person you love or care about. Be radical. Change the paradigm. If you are dealing with chronic pain, tell your family and friends that they need to let things hurt and acknowledge that it hurts instead of trying to fix it, cure it or argue you into happiness. Share this video and you may adjust expectations all around. You can do it, and so can I…so let’s make a choice to handle pain, grief, and sadness differently and start today. ← Aimovig, Erenumab, Migraines, Oh My!